There’s a cruel irony to the thought of battling a fire when surrounded by nothing but water. Nonetheless, boating fires are a very real threat to life, health, and property. When boat fires result from unsafe products or from the negligence of an individual or entity, our San Francisco boating injury law firm is here to help. The danger of a boat fire became all too real for two skilled Bay Area boaters this week. According to KPIX, a well-known fisherman was headed back to Half Moon Bay when he started to smell smoke. Another passenger and the fisherman’s dog were also on board. A Venture County Fire Department official told reporters that when the passenger went to investigate, a large amount of smoke came pouring out of the vessel’s engine compartment. The captain issued a mayday call and, after donning protective gear (yes, the dog had a life jacket too), the trio jumped into the water. Thankfully, another boater was in the area and picked them up shortly thereafter. Each year, the United States Coast Guard issues a Recreational Boating Statistics report. As the name suggests, the annual publication’s scope is limited to (reported) incidents involving at least one vessel being used for recreational purposes. In 2015, the report shows that there were 265 reported fires on recreational boats (including all forms of “fire/explosion” listed on Table 16). The fires led to 145 reported injuries and 3 fatalities. We imagine that there are many incidents that go unreported and also that the numbers would be much higher if boats used for commercial purposes were included in the figures. 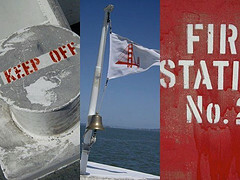 In May 2014, Three Sheets Northwest, an online publication focused on boaters in the Northwest, published an article titled “Why Boats Catch Fire.” Relying on statistics compiled by BoatU.S., the article identifies wiring problems (including AC or DC wiring and appliance issues) as the source for 55% of boat fires in the United States. Specifically, wire chafing was a major source of electrical fires including on battery cables, bilge pump wires, and also instrument wires chafing against hard objects (e.g., vibrating engines, bulkheads, etc.). Shore power issues were also a significant source of fires. The authors note that electrical fires are particularly challenging to extinguish because they can reignite even after being doused by a fire extinguisher. Beyond electrical fires, the next most common sources for boat fires in the U.S. according to the report were engine/transmission overheating (24%) and fuel leaks (8%). We don’t know what caused this week’s fire on the vessel in Half Moon Bay and we are glad to hear that everyone made it to safety. Sadly, this is not always the case. Boating fire injuries and deaths are particularly tragic when they are preventable. In some cases, the problem lies in the boat itself (i.e., a product liability issue), in a faulty repair, or even a careless rental company. If you or a loved one was injured in a boating fire in the Bay Area and believe someone else was to blame, call our San Francisco boat fire law firm to arrange a free consultation.